Mashed potatoes usually involve heavy cream and butter… which is not only not allergy friendly, but also unhealthy. So I made a non-dairy and healthy mashed potato option this week. I adore sweet potatoes… they are much healthier than white potatoes because they have more antioxidants, and I think they taste so much better. So, given the fall season, I made apple cinnamon shmashed sweet potatoes! olive oil for misting, about 2 tbsp. Chop the peeled sweet potatoes into quarter inch rounds. On a lightly greased cookie sheet, spread out the sweet potato rounds and lightly spray with olive oil. Bake at 375 degrees for about 35 minutes, until fork tender. 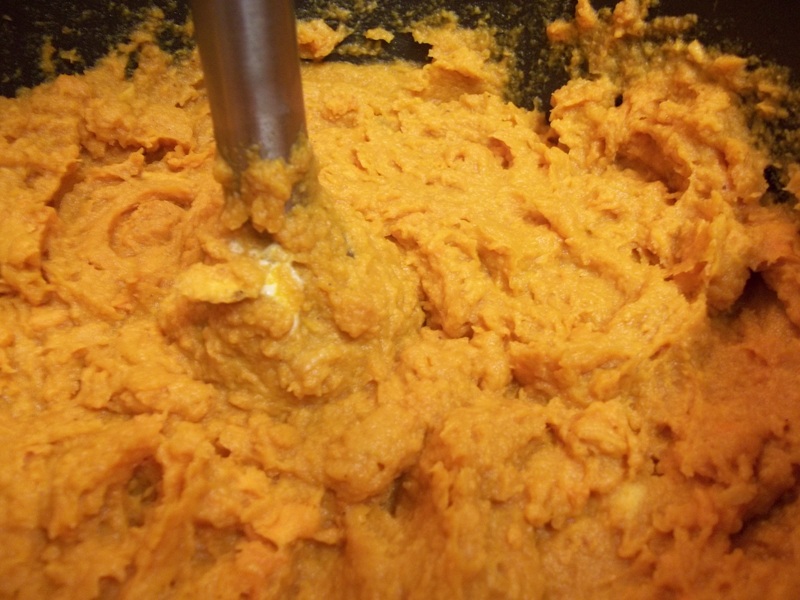 In a medium pot, place the tender sweet potato rounds. Add the apple cider, cinnamon, nutmeg, honey, vegan butter, and salt/pepper. Mix together with a hand mixer until combined.